there we go a lot better. 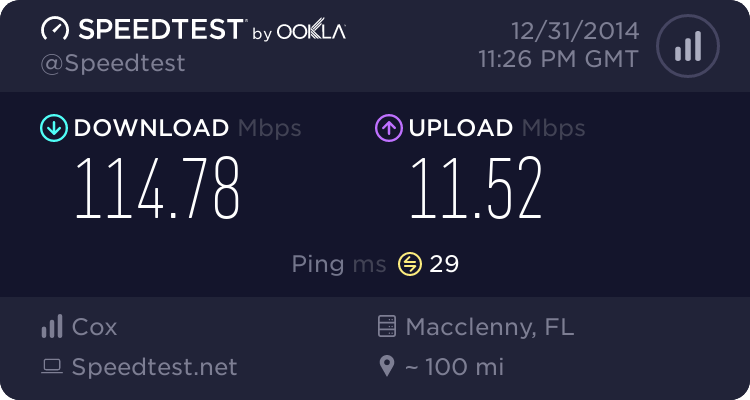 had to get a new modem. When you live in an area that services 22.68 million people, download is prioritized. Take a guess how many of those people use Netflix. Besides, how would your theoretical download speed impact your netflix streams which are usually about 6MBit for HD? 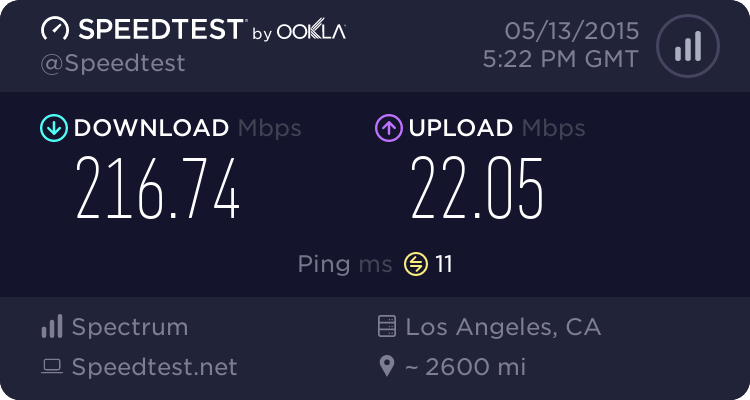 Your connection doesn't get prioritized just because it has a super high bandwidth. Providers started throttling Netflix traffic on their own networks because it took away too much bandwidth (so they said) and then unlocked it once they started paying them for "direct network access". Remember those super-shady deals Comcast, Verizon, AT&T and others forced Netflix into a while ago? As a result Netflix raised their prices and now we pay for our internet twice. Thanks super greedy ISPs! Net Neutrality FTW! Besides, how would your theoretical download speed impact your netflix streams which are usually about 6MBit for HD? Your connection doesn't get prioritized just because it has a super high bandwidth. That bandwidth is a shared pool which I see a difference at peak hours. Netflix has also made major changes to its compression and other delivery mechanisms to push more data for higher quality using less bandwidth to increase its usage to mobile devices as well. As you know, you can Netflix on anything anymore...coming to a car near you if it isn't all ready, followed by flight entertainment. Traffic is actually prioritized by packet at the edge routers and then through the ISP. The ISPs have had to increase priority for video because more and more people use it now. AT&T for example, actually has a plan now were you can do unlimited streaming that does not affect your data usage at all. They've had to change with the times or risk losing customers to ISPs that will allow large amounts of data. Here is mine. 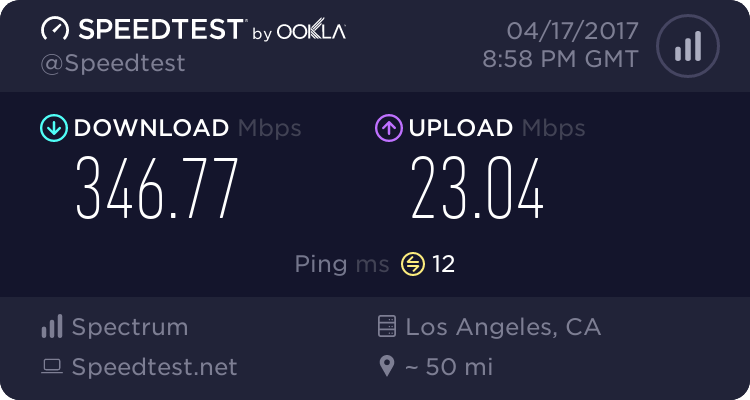 My ISP is WOW (Wide Open West). Our only other choice is Comscrew, I mean Comcast (XFinity).